Total area: 1803,60 sq.m., a useful area of 1547,9 sq.m. 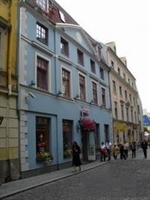 Property consists of 2 4-storied buildings. The object was built in 18 century. Buildings are reconstructed in 1998. Repair was made in 2000. Bearing designs: the bases – a stone, external walls – brick, overlappings – a tree, a roof – a tile. House condition for today: in 1998 major repairs are completely made, including the base is strengthened, overlappings, windows, engineering communications, a roof are changed. The building is reconstructed for tenancy for bureau and commercial premises. The house is equipped by the new modernized fire-prevention and security alarm system. 24 hours of visual protection and the porter. The house is provided by a city central heating, the water drain, cold and hot water. Monetary stream: at present 18 lease contracts for the term of 7-10 years are concluded, common profit in a month makes – 27 953 dollars. Including the VAT. All useful area is completely leased and thanks to favourable conditions and a house site here invariably great demand. Among our clients there are legal and financial consulting bureaus, Spa the centers, stomatology, etc.